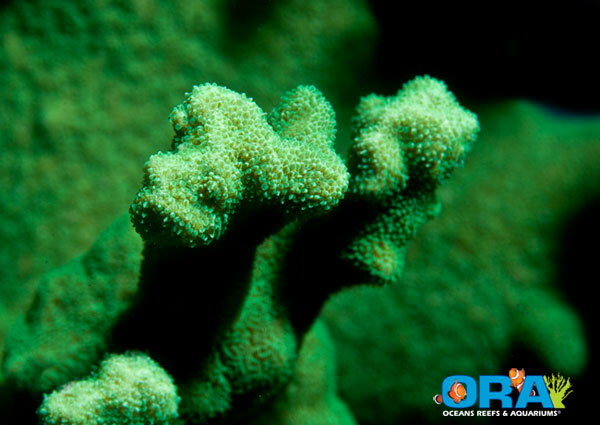 ORA has unveiled a new coral this week, but it’s not a typical Acroporid like most of ORA’s releases. Instead, the new coral is an extraordinarily bright Psammocora. Officially called the Kelly Green Psammocora, this particular coral is actually not at all new to ORA or aquarium hobbyists. It was actually imported from Palau at least 17 years ago and was given to ORA by one of it’s employees, from which the coral gets its name. The coral has been with ORA for the better part of a decade, only just becoming available from the aquaculture company. ORA further adds that the Kelly Green Psammocora has a rather unique growth form for an SPS coral, which we can almost all certainly attest to. Instead of branching out initially, the coral forms a thick encrusted base. Eventually, irregular shaped branches will shoot off every which way. Psammocora corals typically offered to the hobby up to this point have never been all to exciting, though they have always been different from what’s usually seen out there. My first extended encounter with this genus was actually thanks to Eric Borneman, who donated a couple to my setup several years ago. They had a dull maroon coloration and weren’t all that great to look at, but they were extremely easy to care for and grew like a weed. Keeping the history of this coral in mind, I’m glad to finally see a much more colorful Psammocora being placed in the mainstream.